I want to make sure I have this ready to go for you...you will want to check out these lists ASAP and go order what you want before it is GONE for good! If you have not yet ordered 2014-2016 In Color supplies that you want, ORDER THEM NOW! These are notorious for selling out immediately, and reinkers are usually the first to go, followed closely by ink pads, and card stock. I cannot stress this enough: ORDER THEM NOW. Also, I have seen the new catalog, and if there's a punch you really want to have GET IT NOW. I'm not saying we won't have *any* punches, just that I was surprised what didn't carry over. Same for dies, if you've been on the fence and one is on the Retiring List, GET IT NOW. So, I'm going to post the original retiring lists here, and I may or may not update them as often as you'd like. This means, if you see something on a Retiring List, but you can't find it in my ONLINE STORE when you search for it...it's SOLD OUT...even if my list isn't updated to reflect that yet. In other words, my ONLINE STORE will reflect the status of any given item, live. 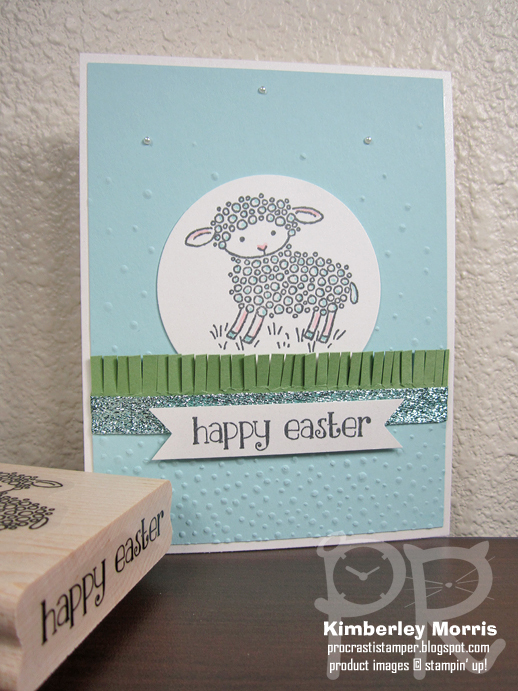 In the picture, you can see the edge of the Easter Lamb stamp, with the index sticker for the greeting. This is available ONLY as a single wood-mount stamp, but I cut the greeting away and mounted it on the other skinny end of the wood block, and mounted the lamb by itself on the large surface of the same block. I like being able to use the lamb alone, because it's perfect for baby cards, or even just a "happy spring" card, or a fun "thank ewe" or "I love ewe" card. Super adorable and versatile, especially if you grab the Alphabet Rotary Stamp along with it. I'll list all the Stampin' Supplies I used at the end of this post, so just scroll down for those details. 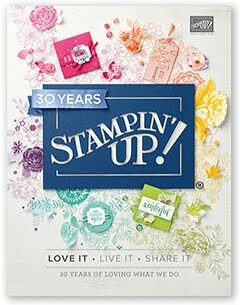 Before I go, let's talk about Stampin' Up! 's Weekly Deals ending. April 18th is going to be the last day of the Weekly Deals promotion, and will be replaced by a better, more exciting, albeit less frequent, promotion called Special Offers. There will be MORE products and discount tiers to choose from! In the meantime, check out what's available in Weekly Deals this week. Guys, the Gift Bag Punch Board is $5 OFF!!! Stampin' Supplies: Whisper White Shimmery card stock, Pool Party card stock, Wild Wasabi card stock, Pool Party marker (or you could use the ink pad and a Blender Pen), Blushing Bride marker (or you could use the ink pad and a Blender Pen), Basic Gray Archival ink pad, Softly Falling Embossing Folder (use with Big Shot), Fringe Scissors, Pool Party Glitter Ribbon, 2-1/2" Circle Punch, Basic Pearls, Fast Fuse Adhesive, Stampin' Dimensionals.